At Teversal, (Nottinghamshire) mechanised mining was introduced in the newly developed First Waterloo seam with the introduction of a rope hauled power loading Anderton shearer, on 1s a panzer armoured face conveyor and hydraulic props and link bars. The machine cut one way and ploughed back the other. However ponies were still employed in transporting supplies to the tailgate lip. A flat rate of £5 a shift was paid in the new seam with the production task being 2 strips or shears a shift. There was a friable roof in the Waterloo seam and major roof falls were experienced, particularly on the second face 2s working uphill at 1in8. AB 15 coal cutters and hand-filled faces continued in the Dunsil seam with rigid props and some hydraulic props and W bars and pvc (“rubber”) conveyors. Peake turntables had been installed at the surface to facilitate easier handling, although tubs were still weighed individually at the surface weighing machines by check weighers. These improvements were part of the £1m reconstruction scheme. There was a quaint mix of modern and old fashioned. Canteen Manager / Manageress £9 1s 3d or £6 11s 6d p.w. (per week). State Registered Nurse £520 x £20 - £640 + £30 Industrial Nursing Certificate + uniform £15 p.a. Pay rates for mineworkers was improved by 1s 7d (8p) a shift in March 1957. £1 8s 4d (£1.41½) a shift for surface workers. Deputy Grade II and Shotfirers £15 15s 0d (£15.75) per week. Would not normally be required to work more than 6 shifts a week or more than 23 shifts in four consecutive weeks. There would be a reduction of the weekly rate by one sixth for each day’s unofficial absence. 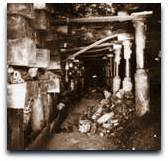 Travelling allowances were introduced if they were transferred from one pit to another. 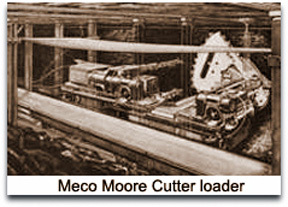 Use of the Meco Moore cutter loader was now at its peak and would decline quickly as faces would be equipped with shearers in the future. A Meco machine is shown cutting out a stable hole. One of the main problems with the machine was that it had to be turned round at the gate ends, hence the stable holes. Working Blackshale seam recommenced at Brookhill (Derbyshire) on 25th March 1957. Drifts were driven into South 3s district at Langton (Nottinghamshire) from the Low Main working and after preparation work, the panel was taken over by Brookhill management. Student Apprenticeship schemes were introduced for mining, mechanical and electrical engineering personnel, their goal being a career in management. The NCB’s Staff College completed its first year. Apprenticeships for Surveyors of mines continued as before, which composed of a day-release course and a separate evening class at the Technical College for about 5 years, which was followed by a 2 paper written examination at Doncaster, Stoke or other centres, followed by a 3-day practical examination which composed of an underground test using theodolite, surface test using level and theodolite, office test including tracing/drawing and calculation and 20 minutes oral, providing of course that the written exam had been passed and a minimum of 2,000 hours underground had been completed. Even after qualification a Surveyor had to be supervised for 3 years by a Senior or Group Surveyor who signed all the relevant documents. Occasionally these anomalies will be seen throughout the book, particularly in the 1950s. Trainee Management courses for First and Second class certificates and examination centres were in tandem at the same venues. At Silverhill (Nottinghamshire) the reconstruction scheme started in 1955 was completed. 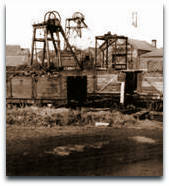 Electric winding engines had replaced the old steam ones and 3½ ton capacity mine cars had replaced tubs for coal winding. A bunker and loading point was installed at the Yard seam horizon in the pit bottom, and the output for 1958 rose to 580,543 tons. Jack Tighe was elected President of Nottinghamshire NUM Branch. Production at the new High Moor Drift mine (Derbyshire) began from the 3ft 3in (0.99m) Clowne seam with handfilling methods and a manpower of 62. A radial fan of only 10hp was used for ventilation flow. This would have to be increased to 30hp in 1959. Originally this mine was seen as part of Westthorpe. The driving of twin surface drifts at High Moor (Derbyshire) continued. 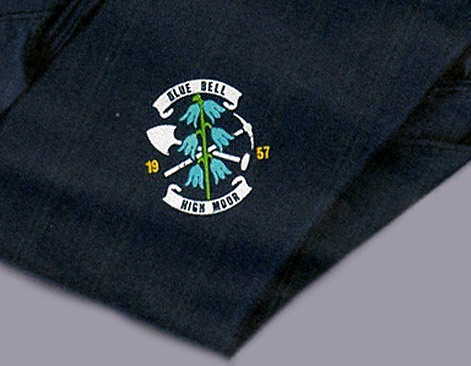 It was called the Blue Bell mine as an emblem on the scarf shows. These were given out to the women employees and was given to me by Margaret Hewitt the only female Cost Clerk. At the interview, later, she was warned that as the only woman at the mine it could be an embarrassment because of the bad language. She said so as not to upset the men she would have to curb her swearing. On appointment she was fixed up with a helmet, duffle coat and wellingtons because part of her job necessitated going across the muddy pit yard, which was a quagmire, particularly after rain. The mine was surrounded by old pits such as: Comberwood, Ashley Comber Wood, Webster’s, Whymsey, High Moor, Westthorpe, Newland, Hall’s Upperthorpe, Upperthorpe, High Moor, Westthorpe and Bagley. At Barlborough Common named pits were: Redding Lane, Woodhouse, Woodhouse Lane, Westfield High Lane, Westfield or sough, Barlborough Common, Beighton Fields, Cottam Hazel, Cottam, Barlborough, Hollinwood (Goslings), Appleby’s, Glebe and Oxcroft. 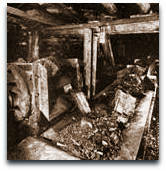 Pithead baths opened at Measham, (South Derbyshire). New office extension was opened at Coleorton Hall to accommodate Area HQ staff. At Denby (Derbyshire) the Silkstone seam coal 1‘ 7” (0.48m), shale 4” (0.10m), coal 2’ 3” (0.69m) was abandoned on 3rd May including the Flamsteed Surface Drift at 1in2.5 sunk 1951, Manager Ronnie CH Hamilton (4441). 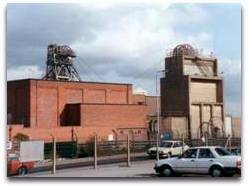 On 23rd May 1957, Pilsley colliery (Derbyshire) sunk in 1864 - 1865 by Thomas Holdsworth, and later taken over by Pilsley Coal Co Ltd was closed after 92 years. No2 pit 12 ft dia (3.65m) sunk 1865, 274 yards (250m) to Blackshale 216 yards (197m) to Tupton, abandoned 1922, pumping shaft. Position SK46SW, 442638, 363124. 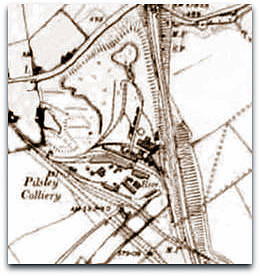 The mine was situated to the north of the village of Pilsley and to the south of Hardstoft Common and the hamlet of Waterloo. The pit top was 595 ft (181m) above sea level. There had been a major strike in 1891. A new canteen was built in 1954. Highest manpower ever was 1,302 in 1913. When the closure was muted in 1956 there were 371 men. At closure the 350 men were offered jobs at nearby collieries. The mine was a unit of No1 Area NCB. Silkstone or Blackshale pre 1884, worked out Oct 1922. The maximum output was 235,046 tons with 627 men in 1951. The maximum manpower was 671 in 1948 when 218,595 tons was produced. 1946: 500 u/g, 194 s/f. 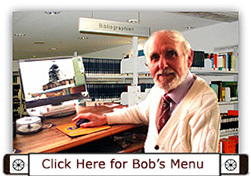 1958: 37 u/g, 34 s/f. Agent Len Gross (2351) - 1957. Frank T Murphy (4644) 1957-1958. RH Swallow (2557) Manager 1950-1958. Terry C Beaver (4436) 1954-1957 (transferred from Williamthorpe). Geoff T Hancock (2755) -1957 (transferred to Glapwell).